Reseller of software tools that promote 'messaging and web peace of mind.' Product areas, regulatory solutions, customers, news, white papers, and reviewers guides. Email Surveys and Data Collection, allows you to design a data collection form or survey, send it to any email address in the world and collect responses into a database. A powerful web data, link, email extractor utility. Collect targeted data from web for responsible internet marketing, website promotion, list management and research. Utility to backup and restore email data in several popular email clients, featuring a multilingual interface. A parent controlled, supervised kids email service for younger children. Childrens email can be sent using webmail or an email client and parents can manage the supervision from their regular email address or the web. Send self-destructing email which also protects against printing, forwarding, mark/copy/pasting, just by adding '.selfdestructing.com' to the end of the recipient email address. No software or downloads required. Works with all email and webmail programs. Email bounce recognition software that automates the process of removing bad email addresses from your email lists. Synergy Email is an unified relationship email and webpage management system with full bulk email capabilities. Free anonymous email service and a couple of other tools. Send email anonymously to anyone you know without that person knowing who sent the email. In-line infrastructure for pre-processing email messages in real time. Allows email management applications to be integrated into any SMTP email system. Web-based email marketing service for small businesses and associations. Create email newsletters, and send and track email campaigns. Email security software for content filtering & email monitoring, email disclaimers, compression, archiving and anti-virus. Company offers shareware email tools for Macintosh, maker of MaxBulk Mailer, eMail Extractor, eMail Bounce Handler, e-Mail Checker, and Web Dumper. Email and messaging software that support the IBM AS400 and a variety of Internet and LAN based standards. AS400 email software products range from basic green screen email to a comprehensive suite of email integration products. Advanced email extractor that extracts email addresses from the Internet, sends mass emails, and helps to create targeted bulk email lists. Provides email software, integration with in-house data, and delivery assurance. Products include Archie Told Me. Bulk email software with email list management and email address extraction. Products include Email Sender Express. Sends bulk email directly to recipients server and bypasses ISPs email server. Innovative email notification software that reads out email messages aloud and notifies you of new messages as they arrive with an adorable animation wizard. Validate that an email address is valid using Java, ColdFusion, or PHP. The tool checks address syntax, dns mx records, and the mail server without sending an email. Developers of email security, email management and email policy enforcement software for Microsoft Exchange server. Ntarget is a web based email marketing tool to develop and manage targeted email promotions. If the business hours of ReSoft International in may vary on holidays like Valentine’s Day, Washington’s Birthday, St. Patrick’s Day, Easter, Easter eve and Mother’s day. We display standard opening hours and price ranges in our profile site. 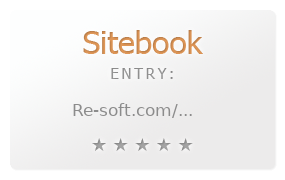 We recommend to check out re-soft.com/ for further information. You can also search for Alternatives for re-soft.com/ on our Review Site Sitebook.org All trademarks are the property of their respective owners. If we should delete this entry, please send us a short E-Mail.